Home > New Listing in Homewood! The two cabins are situated on a fantastic level corner lot, with separate driveways–ideal for full-time or vacation renters while you live here or come and go on the weekends. Main cabin has 2 bdrm/1 bath, and the second cabin is a studio, the property has been in teh same family since the cabins were built. Conveniently located near Tahoe Pines HOA beach and pier (optional HOA membership only $175/yr!). Paddleboard, kayak, swim or just relax on the pier at sunset. Easy access to the West Shore bike path and numerous hiking trails in the area. 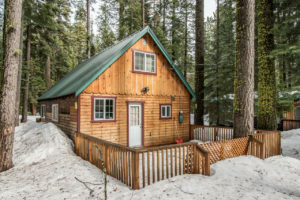 Minutes away from Homewood Ski Resort and Obexer’s General Store and Marina, as well as Sugar Pine Point State Park and all it has to offer. Only 10 min drive to shopping & dining in Tahoe City. Wonderful location for all seasons! The Homewood area is known for its quiet mountain feeling and tall trees, all right next to the ‘Jewel of the Sierra’, Lake Tahoe.